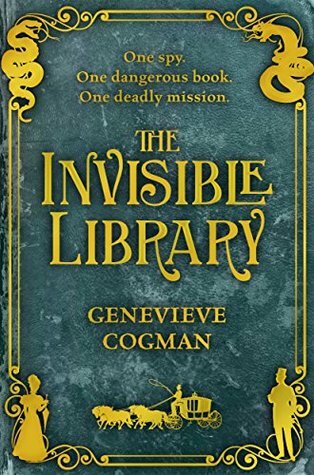 The Invisible Library was an impulse buy last year, it sounded good and the reviews were pretty decent, only I didn’t read it until now. I wouldn’t have expected myself to actually enjoy the book as it seemed overly stuffy – in the more of a regency than the steampunk way. At least until I got through a good half of it. My original thoughts were along the lines of “this isn’t grabbing my attention quick enough” and I very nearly abandoned it. I had to slog through 50% of this book before it picked up enough for me to continue reading it for a prolonged period of time – which in itself usually tells me that a book is boring – however, the book picked up exponentially after the half-way mark, much to my relief. I think any bibliophiles first or second thought when faced with this book would be “ahhh a book about books and bibliophiles!” ‘Cause it was one of mine and Genevieve Cogman has done a good job on her debut novel. The Invisible Library is a book about books first and foremost but it’s also about a returning society of book loving Librarians whose main duty is to travel to alternate world’s through various doors and obtain – by any means necessary- a particular book. The book in question for this first in the series is a particular copy of a manuscript – 1812 Grimm’s Fairy Tales – which causes no end of disruption to alternate London. This particular ‘incarnation’ of London is set in the era of Steampunk! There’s cogs, gears, zeppelins and pocket watches galore, which is a definite saving grace for me. Love steampunk. Our main character is Irene and she’s a second (at least) generation Librarian, relatively low on the order ladder but just as tenacious as the rest of her co-workers. She’s rather bookish to me but then with her profession it kind of stands to reason and she’s quite quiet, a touch withdrawn but she doesn’t remain that way. A secondary main character is Kai, an eclectic juvenile delinquent with a touch of a God complex but is fiercely loyal and seductive in his own way. Irene is tasked with taking Kai as an apprentice on a top level mission to recover a book from alternate London; it’s his first mission having been cooped up inside the Library for five years before he’s allowed out into the big wide world. From the get go this mission goes wrong and only continues along this theme throughout, Irene and Kai meet Vale the Earl of Leeds – an Inspector investigating the death of a vampire who was once the owner of the book they’re hunting for. Did I forget to mention that alternate London has vampires, werewolves, fae and all sorts of mechanical beasties? Oops. These are created by an influx of chaos which ultimately corrupts the infected alternate; dragons can help to balance this chaos bleeding effect. Yes, dragons! There’s a cat burglar, a fae hating society called The Iron Brotherhood, mechanical beasties, the fae and the good old human police who are all involved in this hunt and there’s copious use of the term zeppelin which are excellently described as belonging to the Lichtenstein Embassy – a section of the fae. Needless to say there is a big bad in this book – a Librarian turned traitor-to-the-cause named Alberich- a positively evil dude with bad manners and a freaky skin “condition” (read: it comes off!!!) Who tries his best to kill of Irene, Kai and Vale because they’re getting in his way. I’m pleased to say that after several trials and tribulations good triumphed over evil and Alberich is banished from that alternate. Now, in terms of actual writing quality, I was pleasantly surprised by a debut novel from an unknown author. Debuts are generally an unknown entity in and of themselves until the author is fully established as a hit but The Invisible Library was a very good debut novel with a solid plot line and relatable characters (not in the fantasy terms but in terms of their emotional and logical sides) although a touch slow to start it picked up and came to a satisfying end with the perfect set up for the next in the series The Masked City.